This is a grand book about a grand building, but it is an even better book about New York City real estate and about the art of building skyscrapers. Indeed, it is probably the best general introduction to the city's development process available. Tauranac is also the author of "Elegant New York, The Builders and the Buildings, 1885-1915" a fine coffee-table book of major New York landmarks of that period, and "Essential New York, A Guide to the History and Architecture of Manhattan's Important Buildings," a superb pocket-guide. His new book is the companion volume to a 1997 exhibition at the Museum of The City of New York entitled "A Dream Well Planned: The Empire State Building." Next to the Eiffel Tower in Paris, the Empire State Building is the world's most famous urban icon. It pales somewhat in aesthetics with its contemporary rival, the smaller Chrysler Building, but its splendid isolation on the skyline has given it an unrivalled majesty in New York. Surprisingly, the addition of its hefty communications antenna several decades after the building's completion actually improved the building's silhouette by sharpening its peak. If one visually blocks off its observatory and spire, the tower's proportions and form remain superb. (A glimpse at 500 Fifth Avenue at 42nd Street (see The City Review article) or One Wall Street or 20 Exchange Place reveal the attractiveness of such slim towers. Apart from the basic form, the brilliance of the design rests on its chrome-nickel steel rails, or mullions, whose reflections add dazzle to the skyline and which also reinforce the tower's verticality. Some architecture critics at the time of its construction commented that the floral design caps at the tops of the mullions were out of character, but they are minimal and such touches in no way detract from the effectiveness of the treatment. Despite its added celebrity as King Kong's most famous perch, the Empire State Building opened at the wrong time, at least in terms of the developers' hopes for office leasing. It did not reach full occupancy for many years because of the Depression and despite its immediate fame as the world's tallest office building, a record it held until it was surpassed by the Sears Tower in Chicago and the World Trade Center downtown more than three decades later, it never became a prestigious address. Rockefeller Center was creating its own magnetic office enclave and in the post-World War II environment, well-to-do commuters from the more affluent northern suburbs of the city preferred the convenience of the Grand Central area, despite the proximity of the Empire State Building to Pennsylvania Station, which served commuters from New Jersey and Long Island. To this day, major corporate tenants have generally evaded the Empire State Building, whose huge tenant roster includes mostly very small space-users. In the 1970's, Harry B. Helmsley, who then controlled the building, introduced colored night illumination that varies depending on the season and holiday. For a while, four huge searchlights scanned the night sky from the lower observation level on the 86th floor, but were discontinued, presumably because of pressure from the Federal Aviation Authority. For many years, however, the Empire State Building was the lone pioneer in night illumination among major buildings in the city. 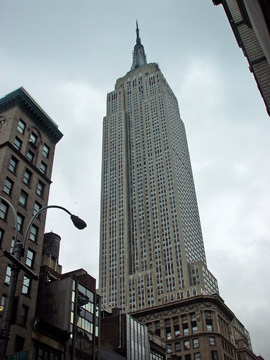 With the inexcusable closing of the open, multi-level observatory atop the former RCA Building at 30 Rockefeller Plaza (see The City Review article), the Empire State Building's observatories are the city's best public promontories. Visitors must descend to the basement level to purchase tickets for the two observatories and then take special express elevators to the 80th floor to transfer to another elevator to the 86th floor, the level of the lower observatory. Its skylobby, therefore, antedates those at the World Trade Center by several decades. The 86th floor observatory has open-air terraces on all sides. A bunch of suicides led to the installation of tall fencing around the terraces, which, fortunately, do not interfere with taking photographs. A small elevator on the 86th floor takes visitors to the top, fully-enclosed observatory on the 102nd floor for no extra charge. Small steps by the windows help smallfry look out as well as help photographers get better angles through the often smudged windows. For vertigo worriers, the top observatory is mall comfortable because it is not open, although its small space might trouble those who are claustrophobic. The view is more impressive although there is unspoken psychological pressure not to linger at one window too long to enable other visitors to share the vistas. While the higher observatory obviously enables wider panoramas of the region, it also slightly diminishes the impact of the skyline views, a function of distance. In March, 1994, the building signed an agreement with the U.S. Justice Department to remove all barriers to its tourist attractions for disabled visitors. The agreement resolved a complaint filed with the department that the building was not in compliance with the 1992 Americans with Disabilities Act that guarantees access to public areas of buildings. In addition to changing its entrances and elevators to comply with the law, the building agreed to install ramps, renovate restrooms, cut away barriers blocking views to visitors confined to wheelchairs on the 86th floor and install periscopes, with King-Kong-shaped handles, for such visitors on the 102nd floor observatory where windows could not be lowered. The building's lobby is suitably tall, but surprisingly disappointing, or, as Tauranac correctly puts it, "reserved." One would not mind a little dizziness in what was for years the world's tallest building. Like the Chrysler Building (see The City Review article), its designers were very full of pride and the main decoration in the lobby is a depiction in aluminum of the tower itself, while the Chrysler Building sports a very large mural of itself on the lobby ceiling. The lobby originally had "a discreet wind indicator that was hooked up to a rooftop anemometer [that] informed as the public of wind speed and direction at the observatory" and the indicator looked like a clock, which in fact subsequently replaced it, Tauranac points out. The Empire State Building lobby is appropriately luxurious, but not impressive and sorely in need in some Art Deco embellishment, but then the building's architecture is relatively spartan, which is understandable given its completion during the Depression. What is historically remarkable is that this building was completed in about a year-and-a-half! Also of historic interest is that a B-25 medium bomber crashed into its 78th and 79th floors on its north facade July 28, 1945 with no major structural damage. "The building shuddered, realigned itself, and settled. Probably instantly, although several witnesses said there seemed to be a moment's interval, came the explosion, and the top of the fog-shrouded Empire State Building was briefly seen in a bright orange glow. High-octane airplane fuel spewed out of the ruptured tanks and sprayed the building…The heat was so intense that partition frames within offices disappeared, and the shattered glass from windows and lamp fixtures melted and fused into stalactites….One engine, part of the fuselage, and a landing gear tore through the internal office walls, through two fire walls and across a stairway, through another office wall and out of the south wall of the building, with the parts coming to a fiery rest at 10 West Thirty-Third Street in the penthouse studio/apartment of sculptor Henry Hering, who was off playing golf in Scarsdale at the time," Tauranac relates about the incident that killed 14 people and injured about 25. The plane crash, which was not the first in Manhattan's history, was not the building's only aerial adventure. Its 1,250-ft-high original peak was designed as a mooring mast for dirigibles, a prospect that seemed exciting at the time. When the World Trade Center's communications mast went into operation, it made the Empire State Building's mighty mast that peaks at 1,454-feet obsolete. A few years after it had lost its crown as the world's tallest building in 1972, its owners told the press they were considering recapturing the title by adding more floors atop the building, but the preposterous notion, thankfully, never took hold. "The Empire State's eccentric fans might not have mourned so if the title had gone to an interesting structure such as the conelike, 2,296-foot concrete tower planned for the Paris Exposition of 1937, which would have been more than a thousand feet higher than the Empire State Building and a worthy successor to the Eiffel Tower. Spiral ramps climbed the outside of the tower, the inside lane of the ramp for descending cars, the outside for ascending. Automobiles could climb to a height of 1,640 feet, where there would be a garage for five hundred cars and a restaurant for two thousand guests, as well as an inexplicable thing called a 'sun-cure station.' The structure would have been called 'Phare du Monde,' or 'Lighthouse of the World,' with a beacon, 2,300 feet high. Or the building's fans might have graciously relinquished the title to the Palace of the Soviets, upon which work was scheduled to begin in December 1938. It would have been twenty-three feet taller than the Empire State Building and topped with the world's tallest statue, a statue of Lenin that would have been three times the size of the Statue of Liberty. The patent impracticality doomed one proposal, and the coming of World War II doomed the other." "One of the ironies of skyscrapers is that because they are efficient and increase the value of the site upon which they are built, they tend to sow the seeds of their own destruction….A dramatic example took place in 1903 at Times Square. In order to make way for the coming of the twenty-seven-story Times Tower, the eight-story, steel-framed Pabst Hotel, which had only been standing since 1898, was torn down….In the 1920's, the site at 1 Wall Street was about to have its third building in as many decades….This constant tearing down and building up, this reinvention of the city every generation, was the single greatest hallmark of modern society to spring up with the coming of the Industrial Revolution. Before then, major buildings, at least, had been built for posterity, and permanence in buildings had been taken for granted." The base of the building fully occupies its building plot, which takes up about two-thirds of the block between Fifth Avenue and the Avenue of the Americas and 34th and 33rd Streets. The main entrance is marked by a large window with cross-hatched panes that brings some natural light into the lobby and a large canopy. The top of the base of the building is surrounded with flagpoles, a welcome addition. Former New York State Governor Alfred A. Smith was deeply involved with the creation of this skyscraper, which sought to glorify not only the city, but also the state. Smith was brought into the project as president of the Empire State Company by John Jacob Raskob, a major shareholder in the General Motors Corporation who had also been Smith's campaign manager in his unsuccessful Presidential race against Herbert Hoover in 1928. The site had been a farm that was acquired in 1827 by William Backhouse Astor, whose descendants later built the Waldorf (1893) and the Astoria (1897) hotels on the site. The merged Waldorf-Astoria (see The City Review article) was demolished for the Empire State Building and the hotel moved to its present location on Park Avenue at 50th Street. The Empire State Building remains as imposing and elegant as when it first opened although it has been surpassed in height and bulk. While it is the visual epicenter of the Manhattan skyline, it has been a loner, albeit one with great fortitude and presence. Manhattan was a major city before the Empire State Building was built, but it is impossible to envision Manhattan without it ever since. It is the city's exclamation point, the eagle feathers in its cap! 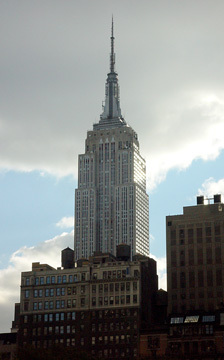 With great humor, Tauranac points out that the Empire State Building is the second so-named Manhattan Building. The first, he observes, is a 9-story structure at 640 Broadway on the southeast corner of Bleecker Street that was built in 1897 to designs by De Lemos & Cordes (who also designed Macy's at Herald Square). The 34th Street Empire State Building was designated an official New York City landmark in 1981 on the occasion of its Golden Jubilee although it had been eligible since the creation of the city's Landmarks Preservation Commission in 1965. Not a minor oversight. Tauranac writes with affection about the building: "It still swells the breasts of New Yorkers and makes hearts beat faster, and it still attracts more than 2 million visitors a year. The building's splendor and lift, its very being remains a magical presence, a cynosure for the city's residents, a mecca for visitors." In 1955, the American Society of Civil Engineers selected it as one of the seven greatest engineering achievements in the history of the country, Tauranac notes, adding that the others were the Colorado River Aqueduct, the Grand Coulee Dam, the Hoover Dam, the Panama Canal, the San Francisco-Oakland Bay Bridge and the sewerage disposal system of Chicago. The building's owners commissioned a series of murals for the 34th Street lobby in 1963 that depict the seven traditional Wonders of the World and the Empire State Building, the eighth wonder, Tauranac observed. Tauranac supplies lots of impressive data: the building weighs 365,000 tons, has 10 million bricks, 27 miles elevator rails, 6,400 windows has appeared in about 80 movies and contains 37 million cubic feet. He documents in fascinating detail the many aborted plans for great skyscrapers that preceded the Empire State Building, in his opinion, the greatest. Among them were a plan of William Fox of Fox Theaters for a 52-story tower at 47th Street and Broadway that would have a theater larger than the 6,200-seat Roxy, a 1,050-ft. high tower planned by Abraham E. Lefcourt for the northeast corner of Broadway and 49th Street, the Larkin Tower, a 110-story building for 42nd Street west of Eighth Avenue, a 150-story structure contemplated by Charles F. Noyes for a site bounded by Broadway and Church, Worth and Duane Streets, a 725-ft. high Broadway Temple in Washington Heights, and a 65-story Christian-Missionary Building between 122nd and 123rd Streets. Tauranac devotes great attention to the builders, owners, contractors and shapers of the Empire State Building, its architects, Shreve, Lamb & Harmon, the Astors who had build the very impressive Waldorf-Astoria Hotel on the site, and, of course, Raskob and Smith, the geniuses behind its development. "There had been nothing originally determined abut how the building should look except that it should resemble a pencil, nothing said about the building's style. Indeed, style was secondary….No caryatids would be straining for effect, no buttresses would be running up the corners of the tower, no oversized heads would be staring blankly into space. There would be no cornices to cast shadows, no entablatures, architraves, or other conventional ornamental devices to break the soaring lines. The design would be strictly functional, determined by the notion that the function of the object should determine its design and materials….Architect Raymond Hood, whose work [architect] Lamb greatly admired and who was a close friend, said that the demands of tenants probably more than the desire of avant-garde architects was responsible for the popularity of the modern style, of this functionalism." "It was big; it was bold; it was beautiful," exclaims Tauranac of the overall design of the building, adding, however, that there are many subtle touches such as tapering walls at the setbacks and chamfered corners at the top and fanlike motifs terminated the great rise of windows. Tauranac's story of the plans to moor dirigibles to the building's tower is fabulous. It was a public relations dream/pipedream and proved to be unworkable, to put it mildly. Interestingly, the top of the tower was to have both an indoor observatory and an outdoor deck (to which the dirigible passengers would descend). "THE new exhibition at the Keith de Lellis Gallery, “New York: A Bird’s-Eye View,” has a striking assortment of aerial views of the city. No image is more arresting than that of the Navy dirigible Los Angeles docking at the mooring post of the Empire State Building, a giant cigarlike cylinder coming nose-to-nose with the tallest building in the world. "That the photograph is a composite, a fake, is disappointing but not surprising: no airship ever docked there, and indeed the whole mooring mast concept was a bit of a stunt itself. "In late 1929, Alfred E. Smith, the leader of a group of investors erecting the Empire State Building, announced that they were increasing the height of the building to 1,250 feet from 1,050. Mr. Smith, a past governor of New York, denied that competition with the 1,046-foot-high Chrysler Building was a factor. “We are measuring its rise by principles of economic investment rather than spectacular standards,” he told The New York Times. "The extra 200 feet, it was announced, was to serve as a mooring mast for dirigibles so that they could dock in Midtown, rather than out in Lakehurst, N.J., the station used by the German Graf Zeppelin. Mr. Smith said that at the Empire State Building, airships like the Graf, almost 800 feet long, would “swing in the breeze and the passengers go down a gangplank”; seven minutes later they would be on the street. "But the Germans, who dominated dirigible technology, had not asked for a docking station, and passenger traffic on dirigibles was still minuscule. The mast camouflaged the quest for boasting rights to the world’s tallest building, an ambition to which it seemed indecent to admit. "Dr. Hugo Eckener, the commander of the Graf Zeppelin and the world’s expert on dirigibles, said flatly that the Empire State project was not practical. Zeppelin landings required scores of ground crewmen, retaining ropes fore and aft, and even then landings were sometimes dicey. Dr. Eckener had trained the dirigible crews for the bombing raids over London in World War I. "The dirigible docking project was still up in the air in March 1931, when Dr. Eckener visited the tower, after which all he had to say was that the matter required further study. 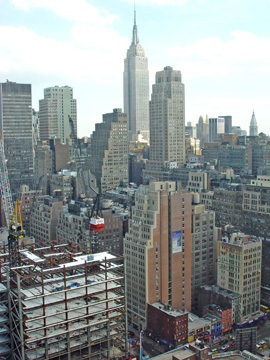 The Skyscraper Museum has photographs of the construction of the Empire State Building online. "The tallest building in the world opened that May; the developers acknowledged that the apparatus for winching the airships had not yet been designed. In December the Navy airship J-4 flew from Lakehurst and hovered around the tower at the request of a newsreel company. The 30-mile-an-hour winds, described as “treacherous” by The Times, made the approach difficult. "In mid-September another dirigible was able to jury-rig a three-minute connection to the top of the building, in 40-mile-an-hour winds. Two weeks later the Goodyear Blimp Columbia picked up a stack of Evening Journals from the newspaper’s plant at 210 South Street and lowered them on a 100-foot-line to a man on the tower, who was able to cut the bundle free. "The Columbia tried to connect again the next day, but could not. That was the last recorded attempt to make contact of any sort; in the same year NBC began broadcasting from the tower. "In 1936 Dr. Eckener passed over the Empire State Building at night on his way to Lakehurst. In command of the new dirigible Hindenburg, he resisted Nazi efforts to take over the airship program, and by May of the following year had been replaced. That was when the Hindenburg burned and crashed in Lakehurst, effectively ending commercial passenger travel in airships. "Donald Friedman, a structural engineer who contributed an essay to the 1998 book “Building the Empire State,” edited by Carol Willis, said that strictly from a structural standpoint the notion of securing an airship to the Empire State Building, even at the very top, was a reasonable one. John Tauranac, the author of the 1995 “The Empire State Building,” agrees. "But the notion that passengers would be able to descend an airport-style ramp from a moving airship to the tip of the tallest building in the world, even in excellent conditions, beggars belief. "The original docking level is one floor above the 102nd-floor observatory, up some steep stairs behind an unmarked door. The stairs lead to a circular room perhaps 25 feet across. "A door leads out to the circular terrace where passengers fresh from Europe or South America — and their steamer trunks — were to have set foot on American ground. "The terrace is perhaps two and a half feet wide, and the parapet could not be any higher than that; it’s like standing on the raised lip of a Campbell’s soup can, a quarter-mile up. "And because the terrace is circular, each side disappearing left and right, there is an uncomfortable sensation of being pushed outward. Were I arriving from Germany, I would have opted for blinders before leaving the nose. But it is an intoxicating view." The legendary tale of the building's remarkable construction page is detailed wonderfully as is the aluminum fountain in the tearoom and soda fountain, which charged an admission of $1, on the building's 86th floor that after Prohibition became the world's "highest bar." In 1934, Walter Witko and his Empire Statesmen staring playing music for dancing at night in the tearoom, Tauranac recounts. Despite all of its hoopla, the building ran smack into the Depression and a year-and-a-half after it opened was only about 25 percent rented and Tauranac documents the travails of the "Empty State Building." "In July, 1931, the National Broadcasting Company leased the eastern half of the eighty-fifth floor for the erection of an experimental television and sound station, whom which television images would 'jump' into space," Tauranac wrote, adding that "there would not be any regularly scheduled broadcasts until April, 1938." By 1936, the middle of the building was still unrented, according to Tauranac: "The only sign of life in them was at night, when the building kept lights burning on the empty floors." "The day of the superskyscraper had been declared over by 1935. Vacant office space in New York early in 1934 had reached an average of 21 percent," he continued. Economics has always played a significant part in the building's history and Tauranac recalls that after it lost income from television transmission fees to the World Trade Center, "Robert W. Jones, an architect with the successor firm of Shreve, Lamb & Harmon, started noodling with how to make the building once again the world's tallest." "He thought the solution was to tear down the dirigible mooring mast and the top six stories and replace them with a new thirty-three story structure to make the 'new' Empire State Building 113 stories high, taking it to a height of 1,494 feet - 144 feet higher than the Twin Towers and 44 feet higher than the Sears Tower. Jones created two versions of the same proposal: One had the top tapering from two sides; the other was an updated version of the original roofline for the eighty-sixth floor." The startling and absurd plan made the front-page of The New York Times, although Tauranac writes that Jones "never submitted his concept to management" and nothing came of it. After the book's publication, the Empire State Building made headlines again when several people at the observatory were shot by an angry person, an incident Tauranac is sure to recount with his lucid, vigorous and well-researched style in future editions. The book has 53 black-and-white illustrations. New wireless antennas on side of tower's top are unsightly and inappropriate "carbuncles"
The zoning and franchise subcommittee of the land-use committee of the City Council held a hearing August 23, 2010 on several applications by Vornado Realty Trust for zoning variances to permit it to erect an office tower nearly twice as tall as current zoning allows on the site of the Hotel Pennsylvania on Seventh Avenue between 32nd and 33rd Streets. The 22-story hotel was designed by McKim, Mead & White to be compatible with the firm's fabled Pennsylvania Station across the avenue that was demolished in the 1960s. Vornado's proposed tower, which is known as 15 Penn Plaza, would rise about 1,200 feet, about the height of the Empire State Building without its spire 900 feet to the east. In exchange for the major zoning changes for its projects, Vornado is offering to make about $100 million in improvements to local subway stations including a reopening of the former "Gimbel's Passageway" to the Avenue of the Americas. Vornado, a major owner of real estate in the area, also argues that its project would provide jobs although it has not committed to going forward until it has a major tenant. The Vornado proposal has been bitterly opposed by Anthony Malkin, president of the company that owns the Empire State Building on the grounds that it would "crowd" his building and block many views of it from the west. He took out a full-page advertisement in yesterday's edition of The New York Times in which he said his building "is THE iconic image of New York City's skyline" and that "The City Planning Commission itself has held that a certain standard must be met in exchange for great height," adding that "Less than one year ago a tower had 200 feet of height removed by the Commission because it did not belong '...in the zone of the Empire State Building's iconic spire.'" According to an article in Architects Newspaper by Matt Chaban, Vornado released a rendering, shown at the right, that showed its proposed tower, the Empire State Building and the Hudson Yards proposal "to make the case that it is not the only project reshaping lower Midtown. David Greenbaum, the president of Vornado, told the subcommittee that "New York as a city has to grow," the article said. Mr. Malkin, the article continued, told the subcommittee that Vornado could achieve its goals with a shorter tower with setbacks, something in the 800- to 850-foot range. The subcommittee members expressed considerable ambivalence about the project, wary about its size and impact on the skyline, but also noting the need to remain competitive with other financial centers around the world. Leroy Comrie, the influential Queens councilman who chairs the Land-Use Committee, told Mr. Malkin that "You’re asking us to look at many things beyond this one project.” The article said that "His tone was severe, suggesting at once that such a policy was needed, but also that he was neither prepared nor even interested in formulating it at this point." In an article in the August 24, 2010 edition of The New York Times, Charles V. Bagli wrote that Councilman Comrie "posed a final question...that seemed to foretell how he would vote: 'Is New York City a snapshot taken in 2010 to be held in perpetuity, or is New York City an evolving, dynamic entity?" 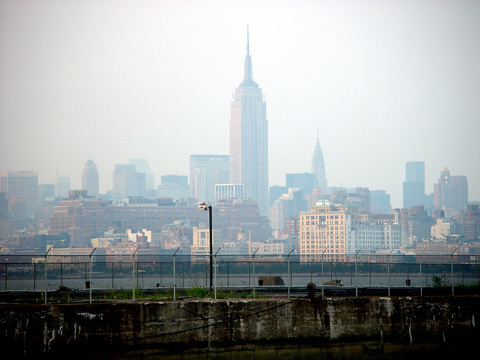 An editorial in the August 24, 2010 edition of The New York Post said "Should the New York City skyline be forever - like a bug cast in amber? Of course not"
An editorial in the Augusts 24, 2010 edition of The New York Daily News said that "since the invention of the electric elevator..., the city's silhouette has been made and remade, with buildings gaining dominance only to be overshadowed with the ascent of new attention-getters," adding "so it is today, even for the grand old marvel of the Empire State." 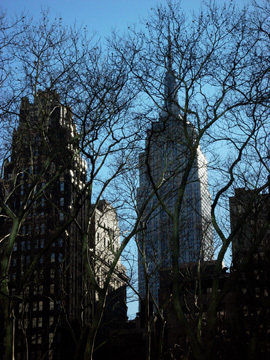 The Land Use Committee of the City Council voted 19 to 1 August 25, 2010 to approve a plan by Vornado Realty Trust to erect a very tall office tower 900 feet west of the Empire State Building, whose owner had argued it would "ruin views of his iconic tower, and thus the city as a whole," according to an article by Matt Chaban at archpaper.com. "In fact, the issue of the skyline barely even came up, and when it did, the council members...essentially said New York must build to remain great," the article continued. "When Vornado showed up at Monday’s hearings without a specific plan for how it would ensure a portion of the contractors on the project would be MWBEs [women- and minority-owned business enterprises]," the article noted, "the committee members were displeased. Councilwoman Letitia James asked if the company even had any sort of minority hiring practices, to which the head of the New York Office, David Greenbaum, joked that he was not sure but had had a party recently at which there were many women, and his wife asked which were employees and which were spouses and he said, with a chuckle, that it was more of the former. James was not amused." The planned tower, which is known as 15 Penn Plaza, would rise on the site of the Hotel Pennsylvania, which was designed by McKim Mead & White to be compatible with the firm's great Penn Station train terminal that was demolished in the 1960s. The hotel occupies most of the western part of the block bounded by Seventh Avenue and the Avenue of the Americas and 32nd and 33rd Streets. The planned new tower has been designed by Pelli Clarke Pelli, which designed the Beacon Tower for Vornado. Vornado, which has many properties in and around the train station, was seeking several zoning variances that would enable it to build almost double what the current zoning would allow for the site. The Landmarks Preservation Commission declined to designate the handsome hotel as a landmark despite the fact that it and the Roosevelt Hotel are the last vestiges in midtown of the very large and major hotel properties that were erected to accommodate train travelers. Anthony Malkin, an owner of the Empire State Building, campaigned against the granting of the wavers, declaring the proposed building a "monstrosity" and noting that recently the City Planning Commission had ordered 200 feet "chopped" off the top of a proposed new tower designed by Jean Nouvel adjacent to the Museum of Modern Art because it infringed on the iconic skyline solitude of the Empire State Building and it is almost a mile further away from it than 15 Penn Plaza. In exchange for the gigantic increase in zoning for its site, Vornado plans to reopen the "Gimbel's passageway" and install subway entrances in the planned building, at an estimated cost of $100 million. Zoning should be based on land-use principles and not monetary value and, anyway, $100 million is essentially peanuts when discussing a 1,200-foot-high office tower in midtown. The City Planning Commission was completely wrong to "decapitate" Nouvel's slanted skyscraper on the basis of its relationship with the top of the Empire State Building but why hasn't the mayor severely criticized if not fired Amanda Burden for such a preposterous rulilng. An article September 2, 2010 by former Parks Commissioner Henry J. Stern at huffingtonpost.com noted that the chair of Community Board 5 was not amused by the August 26, 2010 vote of the City Council, 46 to 1, to approve five variances to permit Vornado Realty Trust to erect an office tower of about 1,200 feet on the site of the Hotel Pennsylvania on Seventh Avenue between 32nd and 33rd Streets. "The ULURP process has ended and the Council has made its final determination. We remain distressed and dismayed, however, by the level of discussion and debate both in the media and at the Council. "The issue before the Council was not principally about women and minority employment, as important as this issue continues to be in all job areas. Yet, if you were present for the Council debate you would have thought it was at the heart of the matter being voted on. The issue before the Council was not about a battle between two major real estate developers, as many press reports made it out. "The issue before the Council was not about the need to foster jobs during this bad economic climate, for even the developer admits they won't be building for years to come. Yet, a number of our political leaders used that bogus argument as an excuse to support the project. "One development should not be permitted to set a bad precedent for the next, as we believe this one does by upzoning an entire block without a rationale and with limited resultant public benefit. A city as dense as ours, with so many competing interests, needs to thoughtfully and inclusively plan for its future and not let one wealthy and powerful developer override that process. "That was the debate that was entirely missing this week both in most of the media and, even worse, at the City Council. We were disheartened and discouraged by its absence." Mr. Stern, who is president of New York Civic, declared in his column that "Ms. Barbero is spot on," adding that "On this one, the CPC was clearly in the tank, abandoning its customary guardianship and attention to size, taste and design in its eagerness to approve the tower." "We believe," he continued, "that what happened in this case is a textbook example of unsound public policy, favoritism to a particular extremely well-connected developer, and lack of regard for the future of the commercial neighborhood around Penn and Moynihan Stations.....This is a case of the city making an extraordinary gift, probably worth hundreds of millions of dollars, to one of its richest and most influential developers. It is a top-down decision, clearly made at City Hall and not by the Planning Commission, which should have been embarrassed at the tricks they had to turn."